People who wear those hats need to get slapped in the face. @Fluffkiller, I agree, New York Yankee fans should stop wearing Yankee hats because I have a false sense of importance and my opinion on what is cool and what isn't is in my non commercial blood. I don't like it so we should slap people for it. I hate when people do things that I don't like, how could they be such huge tools? @Scruffy You spelt Cano wrong dontcha know? A-Rod, Jeter, Swisher, Suzuki, Cano, Nova, Rivera, Granderson, Sabathia. Boom. How would he not know at least 1 player on the Yankees? Umm... Can I phone a friend? And when they just rest them, don't even fully wear them on their heads.. I go into a hat store and see hundreds of hats and I dont give a f**k what team it is or who the he** is on the team! If I like the hat, I buy it! Fluffkiller: I have a hat just like that. 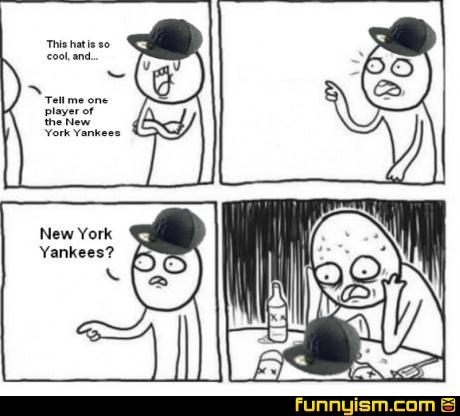 I also have like 5 Yankees hats. Most are the on-field flat brims. I'm also a diehard Yanks fan. Well he was riding his bike and then a lightning storm and now he reads real fast he's good at science and math, BLACK DOCTOR!! On an unrelated troll: the Yankees are what's wrong with baseball. What is this "Yan-kee" you speak of? Let's go Mets!!!!! ....anyone? Anyone? Where is squilliam these days? @RWJ: Not sure if joking, or actually serious about living in NY.